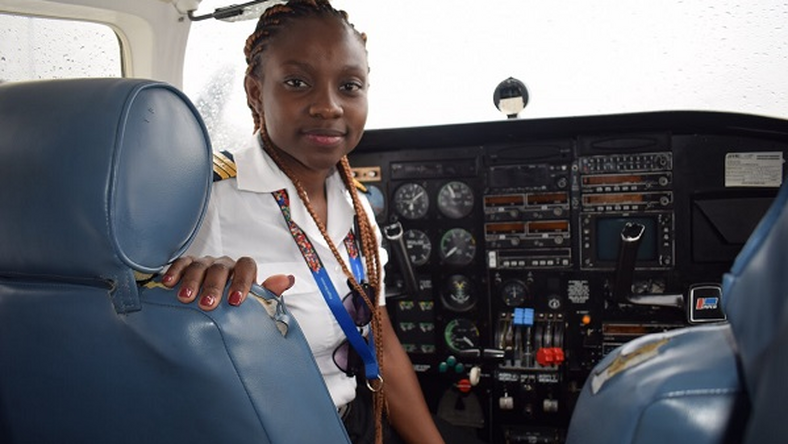 ACCRA, Ghana – The ministry of Aviation in Ghana, West Africa has celebrated Audrey Esi Swatson, 21, the youngest female pilot. Minister Joseph Kofi Adda at a Press briefing in Accra on Saturday, February 16 in honour of the youngest pilot, noted that there are more opportunities for about 500,000 pilots globally. He, therefore, appealed to the youth to attain training to fill up this gap within the West African Sub- Region. Kofi said was pleased that Swatson had charted a course for the upcoming youth in the country, and this has broken the notion that certain jobs are the preserve of men. “We commend you strongly for what you have done. It is very good for us here in Ghana especially those of us in aviation. What is most important for us is that you have shown the way about women flying aircraft,” Adda asserted. In 2009, Kimberly Anyadike, (then 15) an African American teenager of Nigerian descent made history and became the first African American female and the youngest African American to fly an aeroplane across the United States. Kimberly, 25, achieved this great height and set the record after just two years of pilot training through a special after-school program. She was also recognized for her achievements as a young pilot and received the Tuskegee Airmen’s inaugural Young Aviators Award in Tuskegee Alabama in 2015. Related Items:Audrey Esi Swatson, PILOT, top, YOUNGEST FEMALE.